Not quite a formal luncheon, not quite a snack, informal small plate lunches are a great way to entertain guests without the added pressure of fine china. 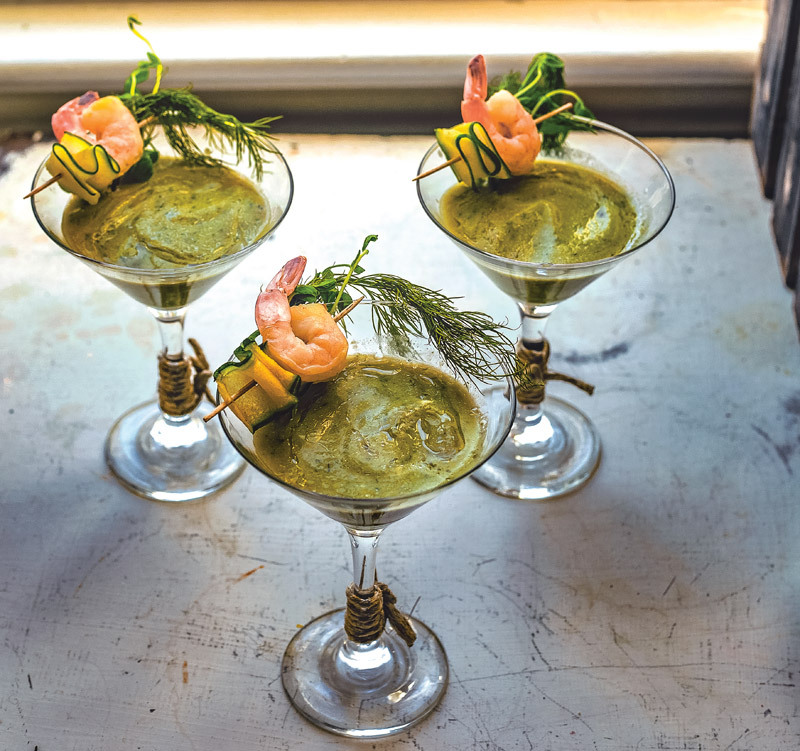 Small plates are generally easy to assemble, each made with simple ingredients, giving you the chance to entertain instead of spend all of your time in the kitchen. Serving a lunch “tapas style” is a great time to experiment with classic dishes in new ways. There’s no reason to reinvent the wheel when it comes to winning flavor profiles, but there is reason to mix them up. Gather your friends and serve them a southern-style ladies’ luncheon they’ll be sure to love. To start, ditch the cucumber sandwiches. Spin it with a refreshing cucumber dill gazpacho to open your meal with the promise of creativity. Follow it up with a microgreen salad with chèvre (goat cheese) and a crispy tarragon crostini. Next up, elevate the picnic staple, chicken salad, by serving it in on an herbed toast with a pickled deviled egg, on the side. 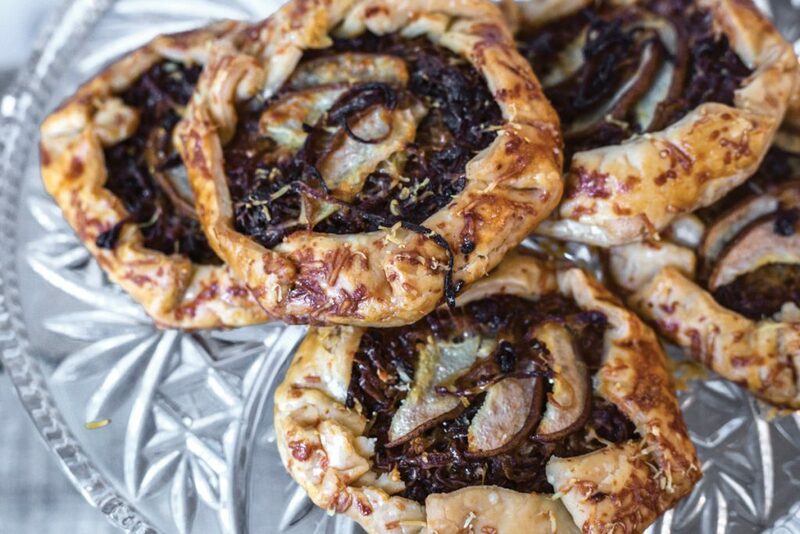 Following that, take a few pages from the French and serve a savory onion pear galette – a delightful dish that is easy to make ahead of time. 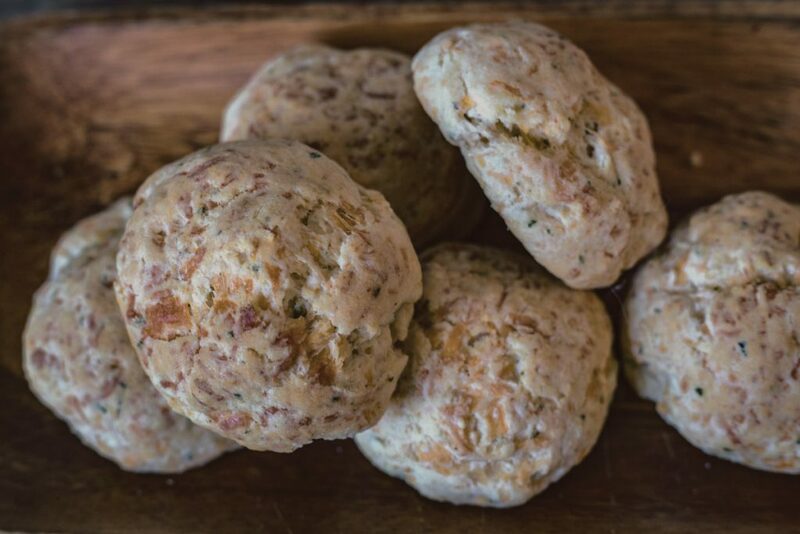 And for an American spin on the French cheese course, opt for pimento drop biscuits instead of a pimento cheese spread. Your companions will be RSVPing to your next lunch before they even receive the invite. Clean and peel cucumbers, chopping them into chunks. Place garlic, onion, cucumber and 1/2 cup of stock into food processor or blender. Blend until somewhat smooth with some small chunks of cucumber or blend to consistency desired. Add yogurt, remaining stock, lemon juice, salt and pepper to combined ingredients in bowl and whisk together until well blended. Season to taste. Pour soup into a tightly covered container and place in refrigerator to chill overnight. (the chilling time mellows the raw onion and garlic and allows the flavors to mingle). In a bowl, put 1 tsp of madras curry powder, 1 tsp olive oil and a splash of rice vinegar. Whisk together. VINAIGRETTE: Add all the ingredients to a blender. Mix on high speed for 30 seconds making sure that the sugar gets completely dissolved and the onion pieces are smoothly blended. Transfer the dressing to a mason jar or similar container with a tight fitting lid. Shake or stir before using. 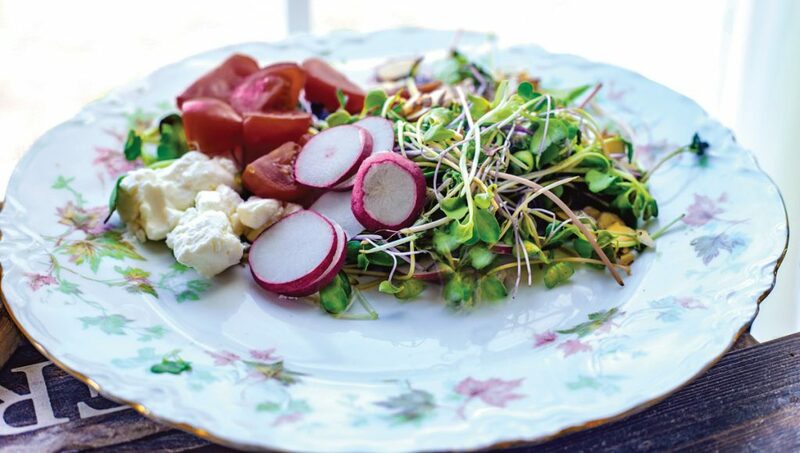 TO PLATE: Place a small mound of greens on each plate and garnish with sliced tomatoes, radishes and cucumbers. Shake the dressing well and drizzle a few tablespoons on each serving. Top with crumbled chevre. Serve immediately. If your luncheon is served buffet style or if the meal will not be eaten immediately, put the dressing in a small pitcher with a whisk so guests can serve themselves. 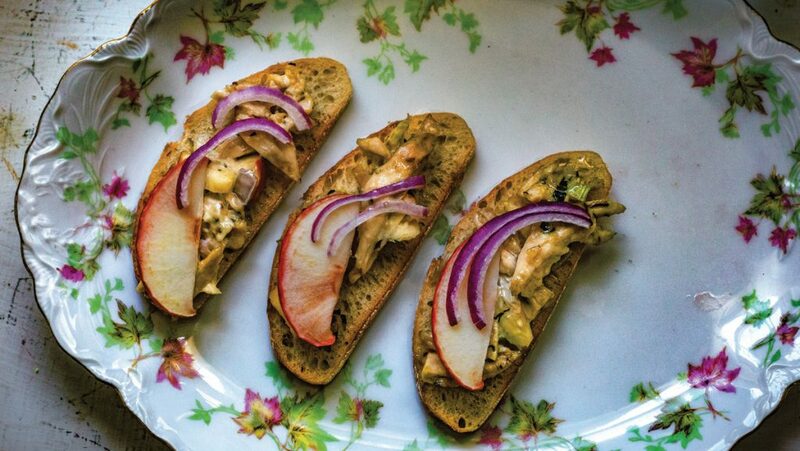 To serve place a heaping spoonful of chicken salad on toast and garnish with sliced apples. In a dutch oven, melt butter over medium-low heat. Add onions and cook 30 to 35 minutes, stirring frequently, until golden brown. Stir in salt and pepper; set aside. Transfer to cookie sheet. Spread 1/8 of the caramelized onions over the individual crusts, leaving 2-inch border around edge. In medium bowl, toss pears with flour. Arrange pears over onions; top with Cheese. Fold 2-inch borders of dough over filling, pressing gently to seal. Brush dough with beaten egg. Bake 24 to 25 minutes or until golden. Cool on cookie sheet on cooling rack 5 minutes. Serve warm or at room temperature. Add milk, and cheddar cheese. Spoon biscuit mixture onto an ungreased cookie sheet. Spoon butter mixture over biscuits. Use a sharp knife to cut a sliver off each end of the egg, then cut them in half vertically instead of horizontally. This will allow them to stand up higher, and be a little smaller, which is less messy. 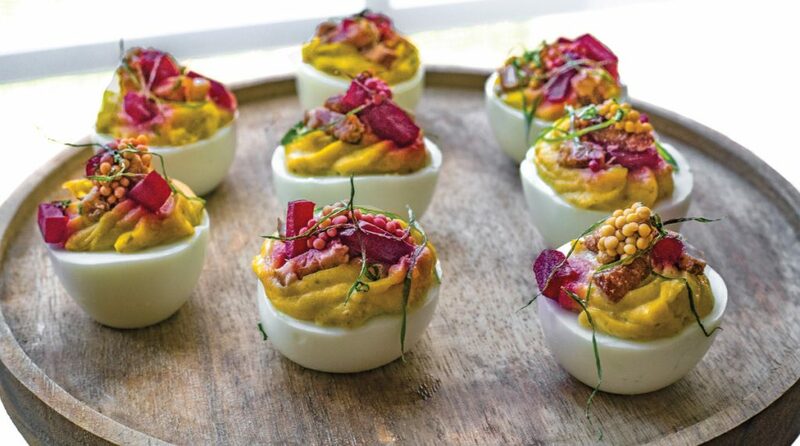 Consider pickling the whole cooked egg in a beet or turmeric brine for 3 days prior to serving to drastically change the color of the white of the egg. Cook the eggs only to medium instead of hard boiled, The trick is to stick to 8 minutes in heavy simmering water. This will make a creamier filling. Your base filling should consist of just aioli or mayo, the cooked egg yolks, and the creative addition of your choice. capers, caramelized onion, anchovies, dill pickles, curry pickles, bread and butter pickles, or whole grain mustard. Keep your garnish consistent with what you put in the filling of your egg. Dill pickles and Whole Grain Mustard in the filling: pickled beets, green onions, Maldon sea salt flakes.